MALTA -- The Great Mother Temples September 20-28, 2019 -- Celebrate Fall Equinox in the Temple! At Circle Wisdom, we travel with the knowing that Mother Earth is a living being. We are of service to our Mother at this time of expansion and awakening consciousness. Travelling with Circle Wisdom expands your spiritual journey; your soul remembers and reconnects with these powerful sacred sites of our world. "Travelling with Moon Dancer is nothing short of pure magic. 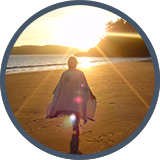 With Spirit, she guides participants on a joyful, transformative journey of new experiences and personal growth, where miracles of healing and manifestation abound. She facilitates beautiful connections with the land and the people for those travelling with her. I have transformed in the care of her wisdom and compassion." "I am SPELLBOUND! The magic is alive in the land of Iceland and my heart is opening to all the raw beauty seeping out of every mountain top, waterfall, rolling green hill and glacier. I have been to a few sacred sites, but never have I had the chance to create one – a medicine wheel for Mother Earth -- on such new land under the guidance of Sequoyah-Blue Deer Eagle and Sandra Moon Dancer. I have come here with a circle of the most wonderful souls, and we are leaving here with experiences to treasure for a lifetime." Sandra Moon Dancer B.Sc., M.H.Sc. has journeyed with Spirit and Mother Earth for over 40 years. The soul’s journey has taken her to sacred sites in Tibet; China; through her ancestral Celtic lands of England, Wales, Scotland and France; across Europe, including along the Archangel Michael energy line though Greece, France and England; Malta; various islands of Mother Earth including Bermuda, Hawaii, her new second home of Iceland and throughout the Sacred land of Turtle Island -- North America..